Flash photo galleries abound and FREE!! 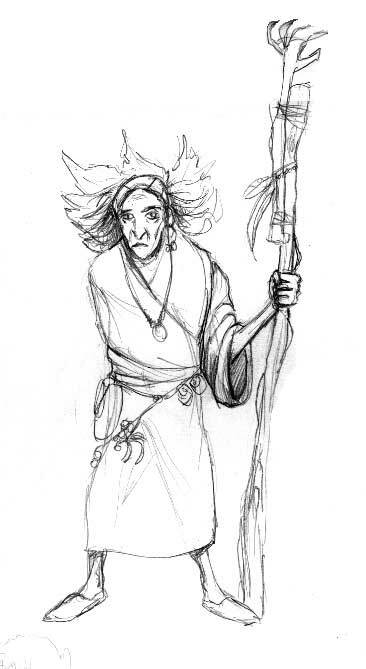 Announcing the Harlenbore project's intent, finished the paused god (cool), sketch of Swamp Witch. Kraken, King Nizeus and the firebeast. The first two were posters that are for sale. 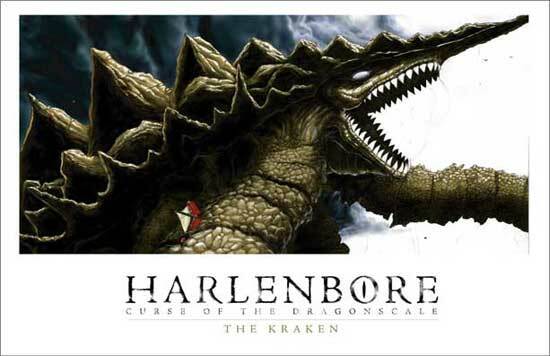 All are additional characters in the Harlenbore story. 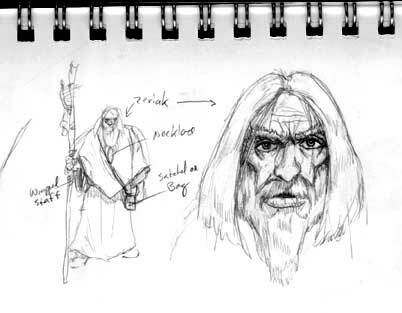 Death Gryphon, Qivhe and his disciples, Rashkin sketches and descriptions. Seik Snakes, Swamp Witch, Zeriak. Characters from the Harlenbore series. A fierce and menacing demon general who will play a pivotal role in the Harlenbore tale. 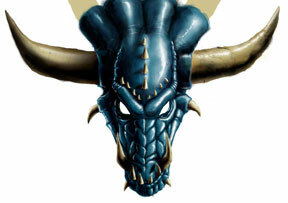 He is the brother of Vakreus and largely the enforcer of the nether realms of hell. It's been a while since I put pencil/pen to paper much less Photoshop colors. These days I spend so much time coding and building stuff vs good old doodles. Our opening tries to show the savagery of the planet that's a setting for our first story. 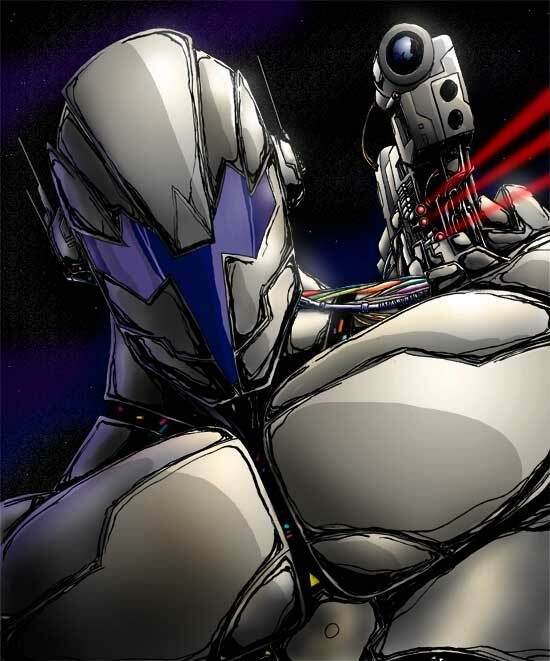 It's a sci-fi story with a hefty dose of payback, iron will, justice and of course dashes of well timed comedy. I'm still honing the story. Hopefully, I'll have more to post soon! (I realize the type isn't legible. Old blog tech I'll fix later). OK, so, its not an annually updated blog now because I posted this a few days before the 1yr anniversary of my last post. Life's fun what can I say. 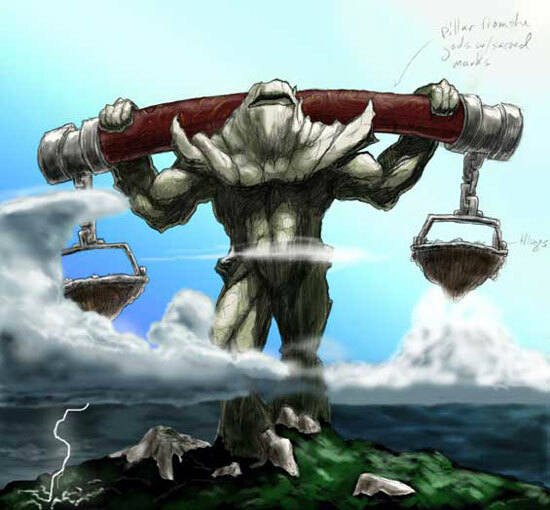 This is a detailed view of a city hanging from the Paused God's lumbering shoulders. See 7.29.05 for the original concept. 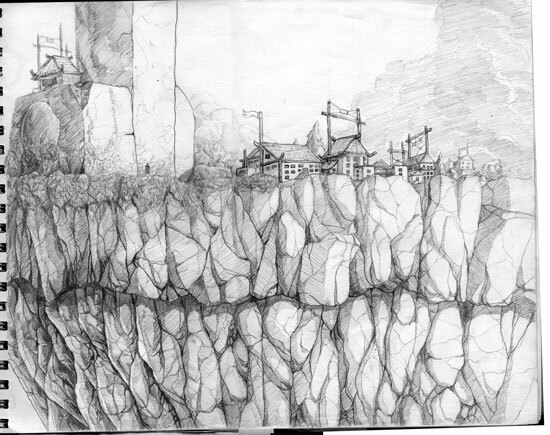 Lots of fun detail on this and helped me think about what people would do if living in a hanging city 100s of feet above the ground. Fun stuff, lots of ideas to shape up Harlenbore's story line and make it unique. More in the works. Hope to post it soon. If anyone wants a low maintenance image gallery, iridium is the way to go. It's display layer is Flash, fed by an XML file. Right mouse clicking inside the gallery area will give you access to the "auto update application". This magical piece automatically reads a directory called "pictures" and: resizes main image, auto generates the thumbnail and writes the necessary XML file. It can work as a stand alone piece or be dropped in another Flash movie. Get it for free at sourceforge. 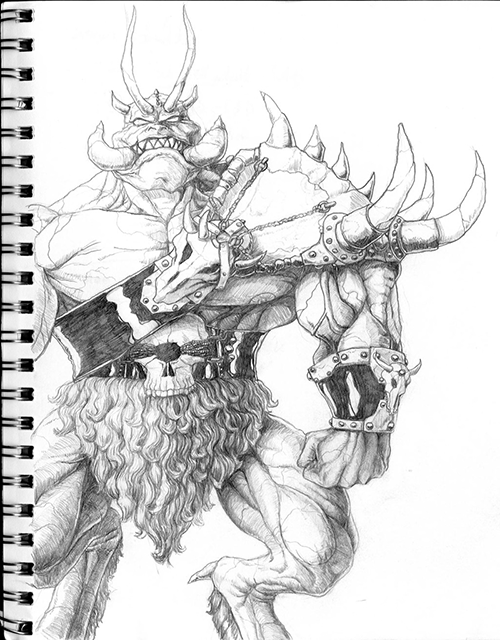 What would a good fantasy tale be without any ogres? Modeled after extensive study of the wonderous WARCRAFT III art I couldn't help but be inspired. Without the help of 3D it's nowhere near the quality these guys hit but the concept is at least there. 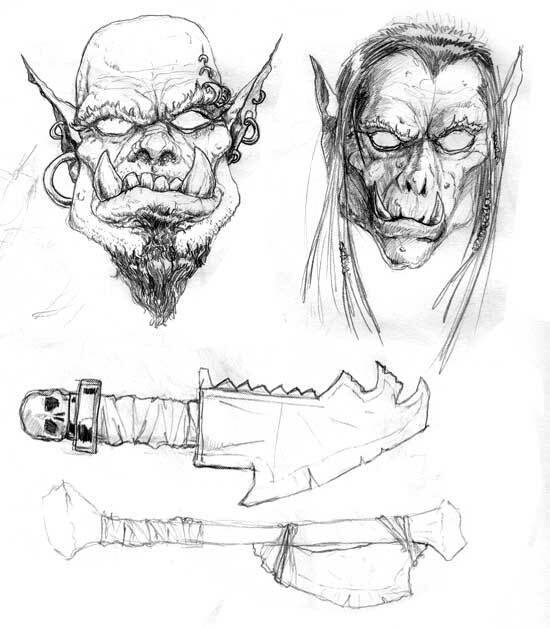 It was fun to get into the mind of an ogre and think of how an outcast and brutish race would fashion a society and weapons with poor metalworking. Nothing outrageously new here because so many before me have done the same exercise. ATOMILUX, INC. is a client I do freelance creative consulting and illustration for and this is their main client. 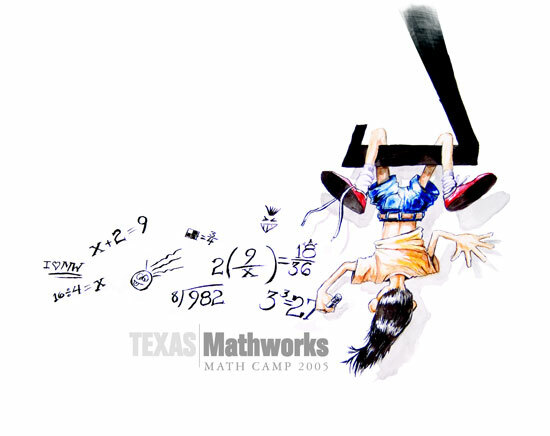 The uniqueness about Texas|Mathworks is that they make learning mathematics fun with nontraditional (japanese) methods of teaching. Their program is phenominal and their student testing before/after is proof it works! I did the original pen and ink on this some time ago. It needs A LOT OF WORK to be a portfolio piece, but it's fun to show the work in progress (80% done). I need to focus more on cleaner edges and the hilights. It's a novel, sketches, and a whole world I'm creating. I guess you could say it's a "property" under development. When I'm done, I will explore: novels, comic books, video games and other licensing. The only unique angle (if there is such a thing these days) is to create fantasy that's never (unless rarely) been seen before. It's a tall order, but I think some good ideas are brewing. This is another character from the Harlenbore series. The premise is that this god raises up his cities every 3,000 years and transports them to a better, more fruitful place. Unfortunately, something happened that froze the god in mid journey suspending the two cities in high altitude. It's a concept I'm very excited about and consider fruitful for the storyline. Last of the big dragons, this soul was tortured in servitude by his master's son. In time, he led an uprising to free his brethren and seek refuge. Summoned by Vakreus' dark brother Korreus, this sleeping beast is commanded to lay waste to an entire city and its inhabitants. I tried selling a poster on eBay and cafepress with NO luck. Oh well. 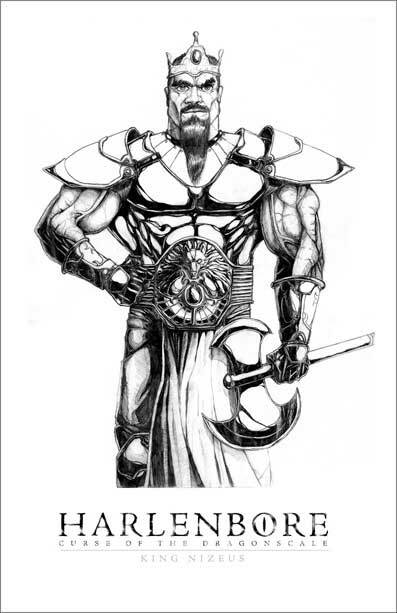 He ruled with an iron fist tempered by only his wife, Aphelian, as a voice of compassion. His kingdom is heir to one child, Sebastian, who was cursed with the dragonscale. The kingdom of Harlenbore fell due to the treachury of Qivhe and his overlord, Vakreus. 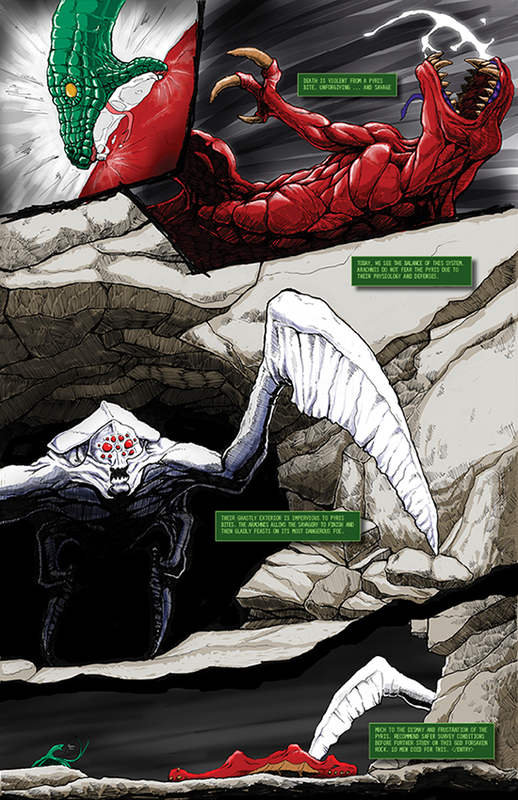 His demise, however, is one epic display of unbending will that is a high point in the story. This too was a poster which hasn't sold, doh! 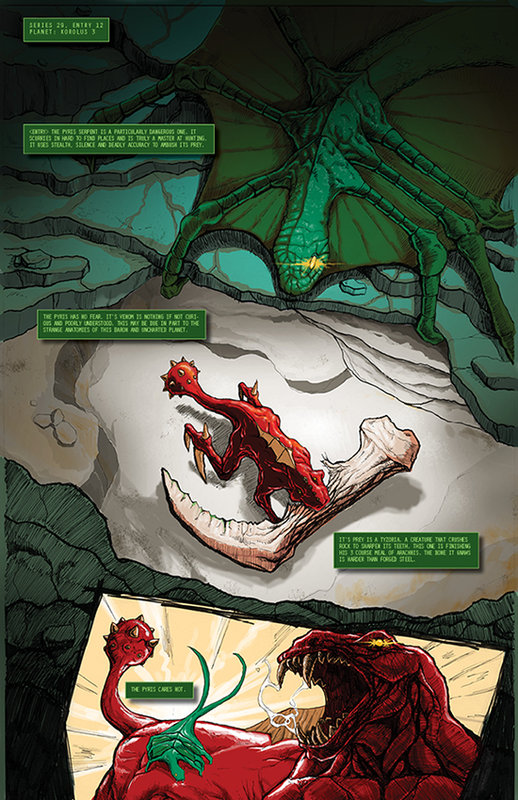 Bred by the goblin hordes, these beasts breathe fire and brimstone. 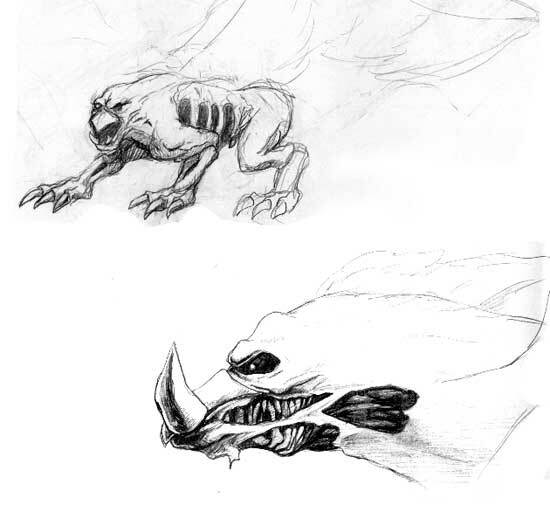 A distant cousin of their dragon counterparts, these beasts are void of wings but retain their ferocity. The majestic gryphons are dying out. Some are kept alive by magic. They live, but in a withering state by which their bodies and minds are eroding. They're in kind of a weak part of the story and I've not exactly fell in love with them so it's possible they'll be cut. 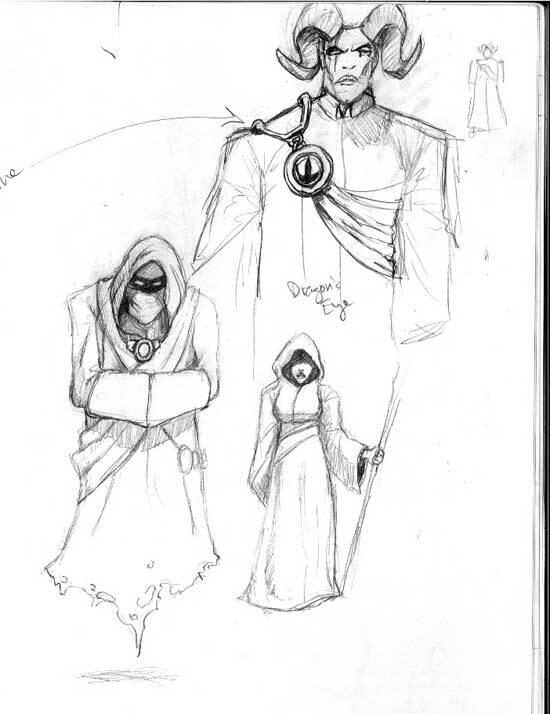 Black sorcerer who promised the bold King Nizeus his problems of black magic would all disappear with his sorcery. On the back of his tongue was treachury and an allegiance to a dark master. This is a sketch of the horned menace and his disciples. The sorcerer, Zeriak, gave Corillius, the broadswordsman, a piece of cheese and a mouse. 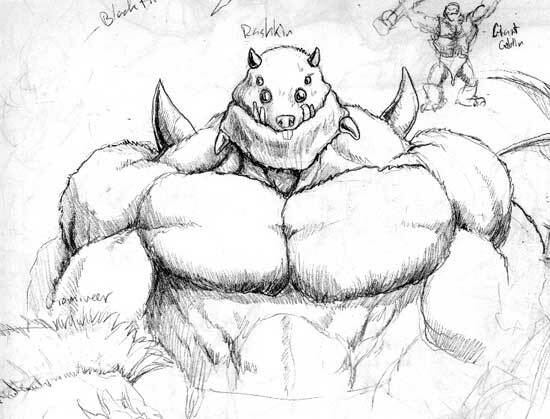 When the two are combined this large warrior rodent is born to rain fierce battle and death upon all enemies. He provides a little comic relief in the story. The cursed forests of Mintsha have many dangers. This is the most prominent of them. 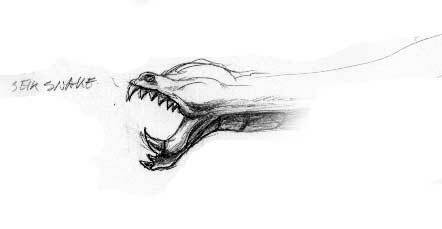 A large serpent that travels in packs, this creature strikes quickly and viciously to snare its prey from the ravenous pack. An interesting and tragic tale. The old witch sold everything she had to a crafty mage for one magical talisman. The mage neglects to tell her it's so powerful that no human may wield it. When she taps its magical capabilities, a disasterous magical bold consumes the old woman's arm, withering and detaching it. The minions she was fending off while attempting to use the talisman take her arm back to their lair. The witch crafts a way to regain her talisman, but in her haste, yet again is befelled by a curse. This is one of my favorite characters in the story. My only challenge is to develop her character in such a way that it becomes witty and darkly endearing. Retired from servitude as a wizard. Zeriak sought quiet days in the village of Norinval. Most of them were. He spent most of his time growing ever more powerful and consuming books of magic. Until, one day a young babe is found in their midst. All imagery and text is copyright Steve Lux, 2005. Reproduction in whole or part of this page's materials is not possible without written consent from me, Steve Lux.